Roseau is the capital, principal town, and major port of Dominica, an island nation of 72,000 people in the Caribbean Sea. The town had a population of 16,582 people in 2007, making it one of the least populous capitals in the world. Roseau is located on the southwestern coast of the nation at the mouth of the Roseau River. Its main exports are skin oils, limes and their juice, tropical vegetables, and spices. Throughout the nation’s history the town has been the commercial center of the island. The history of Roseau had begun well before Europeans began to settle the island nation. The island of Dominica was discovered and named by Christopher Columbus on November 3, 1493. It was occupied, however, only by the Carib people for the next century. When the Spanish finally attempted a settlement, the Carib drove them from the island. In 1642 Father Raymond Breton, a French missionary, visited the island and encountered a Carib village where Roseau now sits. The Carib called the area Sari. French woodcutters, who were the first Europeans on the island, befriended the natives and lived together with them until increasing French settlement caused the Caribs to retreat to interior forests. The new French settlers renamed the Carib village Roseau after the river reeds, Roseaux, that grew on the river banks. The town’s location meant settlers had access to fresh water from the river and flat lands in the area to cultivate. The French also brought the first enslaved people from West Africa to the island colony. By 1800 people of African ancestry were the majority of the island’s residents where they toiled on coffee plantations, and the majority of the inhabitants of Roseau. Slavery was abolished on the island and throughout the British Empire in 1833. Dominica by that point had become the object of nearly half-century struggle between the French and the English. The 1763 Treaty of Paris which ended a global conflict between the British and the French called the Seven Years’ War (on North America it was called the French and Indian War), allowed the French to maintain control. By 1783, a second Treaty of Paris, which gave the United States independence from Great Britain, allowed the British to occupy the island. Originally the British had planned to make their new settlement, Portsmouth, the capital of the island but nearby swamps and the threat of disease forced them to keep Roseau as the colonial administrative center despite the fact that most of its buildings were destroyed in the multiple years of fighting between the French and British. Roseau remained the British colonial administrative center through the 19th Century and part of the 20th Century until the nation of Dominica became independent on November 3, 1978. Today the town has Government House where the parliament meets, as well as other government buildings and the island’s public library. Roseau’s town leaders have preserved some of the architecture from colonial times in both private homes and commercial buildings. The business and shopping districts are south of the Roseau River as is the old French Quarter where the original settlement was established. 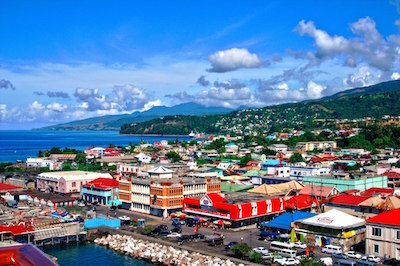 "Roseau," Encyclopedia Britannica Online, http://www.britannica.com/EBchecked/topic/509835/Roseau; "Welcome to Roseau," Roseau City Guide, http://www.roseaucityguide.com/; "History Roseau," Roseau Dominica, http://www.roseaudominica.org/roseau_history/.